The Jewish Passover is almost here. In honour of the Jewish tradition here’s a short film made by David Berenbaum, a Jewish scriptwriter. ‘Shalom’ was one of the many spoofs of the Budweiser ‘Whassup’ ads (written up here) at the turn of the century. Originally sponsored and posted at Neurotrash.com, the 60 second short film is now orphaned, surviving at sites such as Adrants. 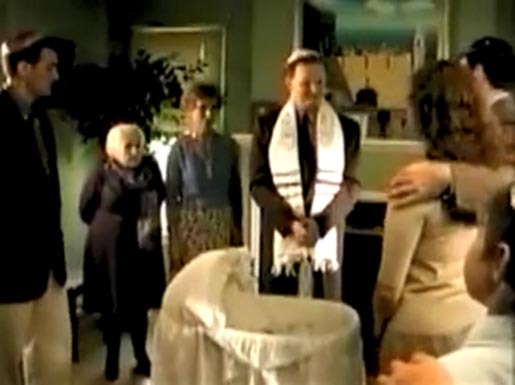 Shalom’ begins at a circumcision – Joshua Rubinstein’s Bris. The rabbi says,”And so, as we stand poised to induct Joshua into the Jewish faith, I say to the proud parents, Rebecca, David…” The rabbi’s phone rings. “Give me a second… Cohen.” “Rabbi! What’s coming off?” “Oh you know… the usual… slicing, dicing. What’s going on with you?” At this point we see that the caller is another rabbi standing in a synagogue, talking in the middle of a reading of scripture. “Oh you know… not much.” There’s a tone. “Is that you?” “Cohen.” “Shalom” comes the voice from a rabbi at the fish shop. “Shalom! Moishe, hang on. Rabbi!.” “Who’s that?” “Moshe.” “Moshe? Shalom!” “Shalom!” “Shalom!” …. “Moshe did you send the fish?” “I sent Mordecai.” “Moredecai?” Coming up the stairs is Mordecai. “Get off your …. and come and carry this yourself.” “Hang on one second. White Fish”. Now it’s the Jewish undertaker. “Shalom!” “Shalom!” “Shalom!” “Shalom!” “Shalom!” The door bell rings. It’s Mordecai. “I brought fish!”. The super: “Whitefish. Oy! Film director David Berenbaum entered ‘Shalom’ in the HBO Comedy Festival in 2001, winning the attention of both rabbis and Disney. He joined the Disney Writers in Residence program, writing scripts for The Haunted Mansion and Elf. He is working on two new movies, “Zoom” and “Spiderwork Chronicles”. Anyone recognise the music in the background? Or catch the words used by Mordecai coming up the stairs? Or have the right spelling for the names?